The number one citizen in Israel is the state president. The president symbolizes the unity and sovereignty of the state. Offered is a collection of autographs of the first seven presidents of the State of Israel. The collection covers the years from 1949 through the resignation of Ezer Weizman in July 2000. WEIZMAN, Chaim. Instrumental in the establishment of the State of israel. Israel's first president (1949-52). 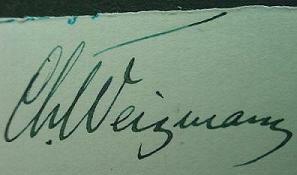 A wonderful signature, in English, removed from a typed letter. BEN-ZVI, Itzhak. Second President of Israel. He served two full terms as was re-elected for a third term when the presidency was not yet limited to two terms. Bank check dated 20 July 1948 made out to a physician. Boldly signed by Ben-Zvi. Interesting the Scroll of Independence was signed not two months before. SHAZAR, Shneour Zalman. Israeli's third President (1963-1973). Short hand written note on his imprinted note paper. Written and signed in Hebrew. KATZIR, Ephraim. Eminent scientist and fourth President of Israel. Color postcard photograph of Katzir. On the verso is affixed an Israeli stamp which contains a portrait of katzir. Signed in Hebrew by Ephrain Katzir directly below the stamp. NAVON, Yitzhak. Fifth President of Israel. First Day cover commemorating the Karen Hayesod Jubilee (50th Anniversary). Colorful Israeli stamp honoring the Jubilee, cancelled Jerusalem 8.7.1970. Signed in English "Y. Navon." HERZOG, Chaim. Elected sixth President of Israel. Wonderful, colorful First Day cover with two large Israeli stamps. One is of the Golden Gate and the other is of Lion's Gate. Cancelled, Jerusalem 17.4.72,. Hand signed in English by Chaim Herzog. WEIZMAN, Ezer. WWII fighter pilot. Founded the "Air Service" of the Haganah. Elected seventh president of Israel. Fabulous First Day cover wiith a cachet of Begin, Carter and Sadat. Affised is the beautiful Israeli stamp of the Scroll of Independence commemorating the 25 Years of Independence. Cancelled Nemal TE'UFA Ben-Gurion 18.9.1978. Hand signed in English "E. Weizman."